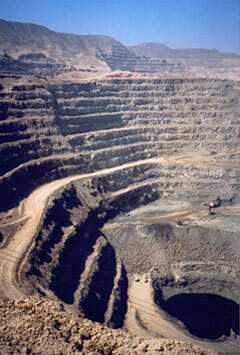 Image: The Candelaria open pit, Chile. Porter GeoConsultancy continued its International Study Tour series of professional development courses by visiting a representative selection of the most important iron oxide copper-gold deposits in South America, in the Andes of Chile and the Carajas region of Brazil. The tour commenced in Marabá, Para state, Brazil on the evening of Sunday 3 June and ended in Santiago, Chile on the evening of Wednesday 13 June, 2007. Participants were able to take any 4 or more days, up to the full tour, as suited their interests or availability. Cristalino ...................... Monday 4 June, 2007. The Cristalino IOCG deposit is located some 40 km to the east of Sossego in a bifurcation of the major regional Carajás Fault in the Carajás district of Para State, Brazil. Basement in the area is represented by the Xingu Complex which is >2.86 Ga in age and is composed of a variety of rocks, including the ~3.0 Ga Pium Complex and 2.9 Ga Greenstones. These are overlain by the 2.76 Ga Grão Para Group of volcanics and sediments, cut by the 2.5 Ga Estrella Granite and subsequently by 1.9 Ga granites but is overlain by the un-metamorphosed 2.7 to 2.6 Ga Águas Claras marine sandstones. Cristalino is hosted by volcanics of the Grão Para Group composed of orange dacite and green andesite with minor basalt and in association with hydrothermally altered and disrupted banded iron formations within this same sequence. These iron formations have been upgraded nearby where they constitute part of the Carajás Iron Resources. Mineralisation is concentrated in a NW-SE trending, sinsitral transpressive zone of shearing over a drilled length of 2200 m and thickness ranging from 10's of metres to 500 m. The shear zone is several hundreds of metres in width and is a splay of the Carajás Fault. The ore zone is generally brecciated and is found in the volcanics below the iron formation and in the lower sections of the iron formation itself. In general the iron formation forms the upper limit to ore and may have acted as a capping. The hydrothermally altered breccia is composed of 5 to 50% sub-angular to sub-rounded fragments. Mineralisation is associated with the emplacement of 2.7 Ga diorite to quartz-diorite intrusions into the volcano-sedimentary sequence and iron formation. There are two styles of mineralisation: (i). 60% of which is crosscutting stockwork veins and veinlets, and (ii). 40% breccia ore where the breccia fragments are surrounded by sulphide veins and a sulphide matrix. Mineralisation is also accompanied by magnetite and associated amphibole alteration. The principal sulphides are chalcopyrite and pyrite in a 2:1 to 3:1 ratio. The Copper was introduced after the magnetite and amphibolite alteration, although the highest grades are associated with the amphibole zones. The iron alteration where it affects the iron formation represents addition, not remobilisation of iron. Hydrothermal alteration progressed from: (i). early widespread actinolite-albite; to (ii). biotite with scapolite and magnetite; to (iii). amphibole with magnetite as hastingsite, grunerite, actinolite and cummingtonite; to (iv). chlorite with albite, magnetite and hematite; to (v). chlorite and carbonate; to (vi). muscovite and carbonate. The average 3-5% sulphide mineralisation is associated with the last three overlapping phases of alteration and comprise chalcopyrite, pyrite and lesser arsenopyrite with trace Ni-Co sulphides. The gold is in the pyrite. 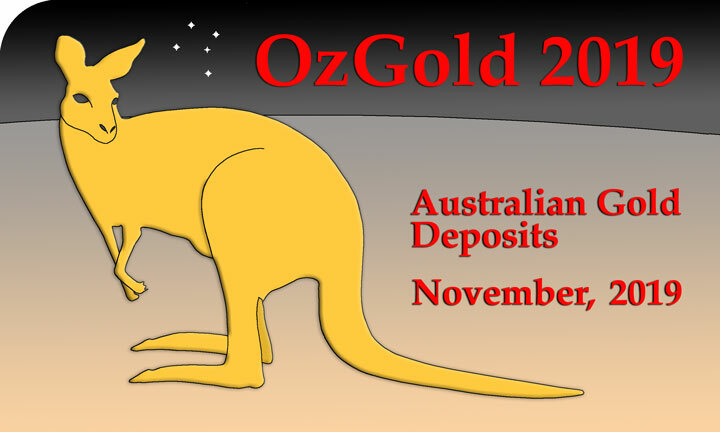 Indications of Cu mineralisation were first noted in the area in the late 60's to early 70's. Grid geochemistry and geophysics from 1984-87 led to 2 anomalies being drilled in 1988 with some 13 holes in two prospects. The second phase of work was commenced in 1997-98 with more grid mapping, geochemistry and geophysics, culminating in a drill intersection of 38 m @ 1.4% Cu, 0.25 g/t Au between 76 and 114 m depth. The resultant approximate resource from the subsequent drilling to 2001 amounted to 500 Mt @ 1.0% Cu, 0.2-0.3 g/t Au. According to CVRD, the reserves amount to 261 Mt @ 0.73% Cu. Sossego ...................... Tuesday 5 June, 2007. The Sossego IOCG deposit is located some 40 km to the south of the Carajás townsite in the state of Para, Brazil. It is approximately 80 km SE of Igarapé Bahia and Alemao, and 40 km west of Cristalino. It is also ~30 km east of the main Carajas Serra Sul iron operation. Mineralisation is hosted along a regional WNW-ESE-striking shear zone that defines the contact between the metavolcano-sedimentary rocks of the ~2.76 Ga Itacaiúnas Supergroup and the basement tonalitic to trondhjemitic gneisses and migmatites of the ~2.8 Ga Xingu Complex. Both the Itacaiúnas Supergroup and Xingu Complex rocks are intruded by granite, granophyric granite, gabbro intrusions and late dacite porphyry dykes in the deposit area. The ages of these rocks are uncertain, although a Pb-Pb zircon age of 2734±4 Ga for a biotite-hornblende granite and a U-Pb zircon age of 2765±39 Ga for a tonalite-trondhjemite (Sardinha et al., 2004) close to the deposit area, are considered the best estimates. In addition, the Palaeoproterozoic Rio Branco granite intrusion crosscuts the hydrothermally altered volcanic and intrusive rocks in the deposit area. This field relationship, together with the lack of hydrothermal alteration and mineralisation of the granite, indicate it was emplaced much later than the formation of the copper-gold ore at Sossego (Xavier et al., 2010). The ore is located in two adjacent centres, Sossego Hill (the Sossego-Curral zones) and the larger Sequeirinho (the Pista-Sequeirinho-Baiano zones) which has a length of 1.6 km and thickness of 150 to 200 m in its central section. These two centres are separated by a major high angle fault. The Sequeirinho orebodies have been subjected to regional sodic (albite-hematite) alteration, overprinted by sodic-calcic (actinolite-rich) alteration accompanying with the formation of massive magnetite-(apatite) bodies. Both alteration assemblages exhibit ductile to brittle-ductile fabrics and are cut by spatially restricted zones of potassic (biotite and potassium feldspar) alteration that grades outward to chlorite-rich assemblages (Monteiro, et al., 2007). The Sossego Hill orebodies display only weakly developed early albitic and very poor subsequent calcic-sodic alteration, although they have well-developed potassic alteration assemblages that were formed during brittle deformation that produced breccia bodies. The matrix of the breccias commonly displays coarse mineral infill suggestive of growth into open space (Monteiro, et al., 2007). The sulphides of both groups of orebodies were initially accompanied by potassic alteration and a subsequent more important assemblage of calcite-quartz-epidote-chlorite. In the Sequeirinho orebodies, sulphides range from undeformed to deformed, while at the Sossego Hill orebodies they are undeformed. Very late stage, weakly mineralised hydrolytic alteration is present in the Sossego Hill orebodies (Monteiro, et al., 2007). The dominant sulphides are chalcopyrite with subsidiary siegenite and millerite, and minor pyrrhotite and pyrite in the Sequerinho orebodies, although pyrite is relatively abundant in the Sossego Hill bodies. In early 2001 the total resource was quoted as 355 Mt @ 1.1% Cu, 0.28 g/t Au, encompassing a mineable reserve of 219 Mt @ 1.24% Cu, 0.33 g/t Au at a 0.4% Cu cut-off and stripping ratio of 3.3:1 wate:ore.
At the commencement of mining in 2004, reserves were quoted by CVRD as 250 Mt @ 1.0% Cu. Montiero, et al., (2007) published a reserve of 245 Mt @ 1.1% Cu, 0.28 g/t Au. Mineralisation (gold) was initially discovered by garimperos (prospectors) in 1984 within CVRD concessions. The area was tendered to Phelps Dodge in 1996 and the first major intersections were in early 1997. In 2001 the project was controlled by Mineracao Serra do Sossego, a 50:50 joint venture between Phelps Dodge do Brasil and CVRD. In 2002 CVRD bought Phelps Dodge's share and commenced mining in 2004 with a nominal capacity of 93 000 tya of Cu in concentrates. TOTAL Reserves - 120.1 Mt @ 0.68% Cu, with a recovery range of 90 to 95% of contained Cu. Igarapé Bahia ...................... Wednesday 6 June, 2007. The Igarapé Bahia Au-Cu-(REE-U) deposit is located in the Carajás Mineral Province of Para State Brazil. Igarapé Bahia is hosted by the Igarapé Bahia Group, considered to be a lower greenschist facies metamorphosed unit of the Archaean (ca. 2.75 Ga) metavolcano-sedimentary Itacaiúnas Supergroup which comprises two lithological and stratigraphic domains: a lower metavolcanic unit composed of metavolcanic rocks and acid to intermediate volcanoclastics; and an upper clastic-chemical metasedimentary unit and volcanoclastic rocks. The Igarapé Bahia orebodies represents a 100 to 150 m thick gossan-laterite zone from which significant amounts of gold (>60 t) were mined until 2003. Where not outcropping, the primary mineralisation is obscured by a 250 m thick unconformable siliciclastic unit referred as the Aguas Claras Formation. The copper-gold mineralisation at the Igarapé Bahia deposit is hosted by a hydrothermally altered breccia at the contact between the footwall mafic volcanics, with associated BIF and hyaloclastite, and a dominantly coarse to fine-grained metasedimentary sequence in the hanging wall. The breccia unit is exposed at or near the surface as a semicircular annulus, with a form similar to a ring complex with a diameter of approximately 1.5 km. The mineralised breccia unit occurs as a 2 km long by 30 to 250 m thick series of fault dislocated bodies on the southern, northeastern and northwestern sections of this structure, dipping steeply outwards at ~75°, and is nearly concordant with the metavolcanic-sedimentary wallrocks. The economically extracted ore at Igarapé Bahia is largely developed as a supergene gossan-laterite enrichment within the 150 to 200 m thick oxide profile. Three orebodies have been mined at this contact, forming a semi-circular trace at the surface namely, Acampamento - dipping at around 75° to the north-east, Furo Trinta to the south-east, and Acampamento Norte to the north-west, forming an outward dipping domal structure in three dimensions. The oxide zone is characterised by supergene enrichment and hematite, goethite, gibbsite and quartz. This is underlain by a transition zone that may be up to 50 m thick with enriched supergene malachite, cuprite, native copper and goethite and minor amounts of digenite and chalcocite responsible for high grade Cu and Au. This zone is in turn underlain by primary Cu-Au mineralisation, represented by hydrothermal breccias containing chalcopyrite, bornite, carbonate, magnetite and minor molybdenite and pyrite. Strong hydrothermal alteration of the host sequence produced intense chloritisation, Fe-metasomatism, Cu-sulphidation (chalcopyrite and bornite), carbonatisation, silicification, tourmalinisation and biotitisation in the primary zone. Gold-copper mineralisation is localised at the commonly brecciated contact between the metavolcanics and the meta-volcaniclastics-metasediments and comprises, magnetite/siderite heterolithic breccias and hydrothermally altered metavolcanics. These rocks are enriched in REE (monazite, allanite, xenotime, bastn�site and parisite), Mo (molybdenite), U (uraninite), F (fluorite), Cl (ferropyrosmalite) and P (apatite). Production has been at a rate of around 10 t Au per annum, with the remaining reserve in 1998 being 29 Mt @ 2 g/t Au. The deposit was and is controlled and operated by CVRD/Vale. Alemão ...................... Wednesday 6 June, 2007. The Alemão IOCG Au-Cu-(REE-U) deposit is part of the Igarape Bahia mineralised system in the Carajás Mineral Province of Para State Brazil (see the Igarapé Bahia record). Alemão is hosted by the Igarapé Bahia Group, considered to be a lower greenschist facies metamorphosed unit of the Archaean (ca. 2.75 Ga) metavolcano-sedimentary Itacaiúnas Supergroup which comprises two lithological and stratigraphic domains: a lower metavolcanic unit composed of metavolcanic rocks and acid to intermediate volcanoclastics; and an upper clastic-chemical metasedimentary unit and volcanoclastic rocks. The Alemão ore body underlies the far northwestern margin of the Igarapé Bahia deposit, which represents a 100 to 150 m thick gossan-laterite zone from which significant amounts of gold (>60 t) were mined until 2003. Elsewhere it is obscured by a 250 m thick unconformable siliciclastic unit referred as the Aguas Claras Formation. The copper-gold mineralisation at the Igarapé Bahia/Alemão deposit is hosted by a hydrothermally altered breccia at the contact between the footwall mafic volcanics, with associated BIF and hyaloclastite, and a dominantly coarse to fine-grained metasedimentary sequence in the hanging wall. The breccia unit is exposed at or near the surface as a semicircular annulus, with a form similar to a ring complex with a diameter of approximately 1.5 km. The mineralised breccia unit occurs as a 2 km long by 30 to 250 m thick series of fault dislocated bodies on the southern, eastern and northern sections of this structure, dipping steeply outwards at ~75°, and is nearly concordant with the metavolcanic-sedimentary wallrocks. The Igarapé Bahia deposit is the thick gossan-laterite zone developed within the top 100 to 150 m of the exposed breccia unit. The Alemão deposit is located immediately to the northwest of this annular zone, occurring as a particularly magnetite-Cu-Au-enriched down-faulted segment of the Acampamento Norte orebody, the northern most orebody of the Igarapé Bahia deposit. It has dimensions of around 500 m in length, 50 to 200 m thick and has been traced down plunge for at least 800 m below the surface, although the top of the deposit is at a depth of approximately 250 m below Aguas Claras Formation sandstone cover. The Alemão orebody is hosted by a hydrothermally altered breccia at the contact between the footwall mafic volcanics, with associated BIF and hyaloclastite, and a dominantly coarse to fine-grained metasedimentary sequence in the hanging wall. A set of unmetamorphosed 2.75 to 2.65 Ga quartz diorite and 2579±7 Ma dolerite dykes cut the orebodies, the host metavolcano-sedimentary sequence and the overlying clastic metasedimentary sequence of the Áoguas Claras Formation/Rio Fresco Group. The breccia has gradational contacts with its wallrocks and is made up of polymitic, usually matrix-supported clasts, composed mainly of coarse, angular to rounded basalt, BIF and chert clasts derived from the footwall unit. ii). brecciated hydrothermally altered volcanics with chalcopyrite, bornite, pyrite, chlorite, siderite and ankerite both in the matrix and disseminated in the altered country rock. The total estimated resource in 2001 was 170 Mt @ 1.5% Cu, 0.8 g/t Au. More recently CVRD has quoted a reserve of 161 Mt @ 1.3% Cu, 0.86 g/t Au. The deposit was discovered by Docegeo, exploration arm of CVRD in 1996 and is not in production. Salobo ...................... Thursday 7 June, 2007. The Salobo 3 Alpha IOCG Deposit is located in the Carajás district of Para State, Brazil, and is some 30 km to the north of Igarapé Bahia and Alemao and ~50 km WNW of the major Carajas N4 and 5 iron deposits of the Serra Norte. The Salobo deposit was discovered in 1977 and is contained within supracrustal rocks of the Igarapé Salobo Group that belongs to the Archaean Itacaiúnas Supergroup (interpreted to be older than the Igarapé Bahia Group that hosts Igarapé Bahia and Alemao), which is composed of iron-rich schists, metagreywackes, amphibolites and quartzites. This sequence is in tectonic contact with trondhjemitic gneiss of the basement Xingu Complex (Lindenmayer, 2003) composed of partially migmatised gneisses. The original stratigraphic relationships with the basement and within host sequence are masked by intense ductile-brittle shear zones and over-thrusting. These units have been strongly deformed by the 2.7 Ga Itacaiúnas and 2.5 Ga Cinzento ductile shear zones (Machado et al., 1991; Holdsworth and Pinheiro, 2000), and are crosscut by the 2.57 Ga syn-tectonic Old Salobo and the 1.88 Ga Young Salobo granites (Lindenmayer, 1990; 1998). The development of the shear zones resulted in a widespread and penetrative, sub-vertical, northwest-striking mylonitic foliation in the rocks of the Salobo deposit area, with the exception of the Young Salobo granite and late dolerite dykes (Réquia et al., 2003). The principal lithology in the Salobo deposit area is a biotite-garnet-quartz-rich rock, which Lindenmayer (1990) first defined as metagreywacke and subsequently reinterpreted as hydrothermally altered basaltic-andesite and dacite of the Igarapé Salobo Group (Lindenmayer, 2003). The host rocks also include amphibolite, metamorphosed banded iron formation and quartzite (Xavier et al., 2010). The Salobo 3A deposit extends over an area represented by a NW trending strike length of 4 km and is 100 to 600 m in width. Mineralisation occurs as lens-shaped and massive replacement orebodies that have been recognised to depths of 750 metres below the surface (Souza and Vieira, 2000). The deposit lies within the major brittle-ductile Itacaiúnas shear zone and occur as irregularly distributed lenticular shaped ore shoots. The host rocks were progressively metamorphosed to pyroxene hornfels facies, at equilibrium temperatures of 750°C and pressures of 2 to 3 Kbar, resulting from sinistral transcurrent transpressive shearing accompanied by oblique thrusting. This metamorphism produced an assemblage with a coarse granoblastic texture, consisting of fayalite, almandine, spessartine, magnetite, graphite, hastingsite, chalcopyrite and graphite (Souza and Vieira, 2000). The structurally-controlled, steeply dipping, irregular, lens-shaped and massive replacement ore bodies are generally associated with a halo of variably magnetite-rich (<10 to >50%) rocks with Mn-almandine, grunerite, Cl-rich hastingsite, fayalite, schorlitic tourmaline, Fe-biotite, allanite and quartz (Réquia et al., 2003; Réquia, and Fontboté, 2000). The ore occurs within strongly iron-potassic altered rocks in two main zones: i). massive garnet-biotite-fayalite-grunerite rock which generally has >50% magnetite with minor graphite and fluorite, and ii). a foliated, granoblastic, almandine-biotite-gruneriteplagioclase-quartz assemblage with 10 to 50% magnetite, and extends into the adjacent biotite-garnet-quartz schists (Viera et al., 1988). There is a direct relationship between copper and iron grades (Viera et al., 1988; Souza and Vieira, 2000). The protoliths of these iron-rich host rocks are variously interpreted to have been iron formation, which have been metamorphosed to pyroxene-hornfels facies (Lindenmayer, 1990; Villas and Santos, 2001). Similar, structurally disrupted 'iron formations' extend intermittently over tens of kilometres of strike length throughout the district (Siqueira and Costa, 1991). Alternatively, the magnetite-rich rocks might be the product of extreme iron and potassic hydrothermal alteration at high-temperatures (>550°C) of andesitic-basalt and dacite of the Igarapé Salobo Group (Lindenmayer, 2003). In the latter alternative, high temperature hydrothermal alteration would have overprinted rocks that were previously deformed and mylonitised. However, the mineralised iron-rich rocks differ from the regional iron formations in that they are enriched in Cu, Au, Ag, U, F, Mo, Co and LREE, whereas the banded iron formations are depleted in these elements (Réquia and Fontboté, 2000). The lens-shaped and massive replacement orebodies are parallel to planar S-C structures along the main ESE trend of the shear zone, and commonly exhibit plastic flow textures, recrystallisation, mylonitisation and brecciation (Lindenmayer, 1990; Lindenmayer and Teixeira, 1999; Siqueira and Costa, 1991). In this context, episodes of ore remobilisation during development of the shear zone are possible (Siqueira, 1996). The copper-gold mineralisation in the massive replacement orebodies comprises large quantities of magnetite with disseminations of chalcocite and bornite, accompanied by subordinate chalcopyrite and associated covellite, molybdenite, cobaltite, safflorite, native gold and silver (Lindenmayer, 1990; Réquia et al., 1995). Gangue includes variable proportions of magnetite, amphibole, olivine, garnet, biotite, quartz and plagioclase. Late veins with chalcopyrite, calcite, epidote, quartz and fluorite, controlled by Riedel shear structures, are also present at Salobo (Lindenmayer 2003; Siqueira, 1996; Réquia et al., 2003). The Cu grade is generally proportional to the magnetite content, with the highest grades in >50% magnetite which have >1% Cu, while the bulk of the ore in a schist with 10 to 50% magnetite and containing 0.6 to 1.1% Cu. Other lithologies within the orebody and shear zone have variable iron contents, with Fe silicates (fayalite, grunerite, biotite) predominating and <10% magnetite, as well as lower Cu and Au. The paragenetic sequence in the Salobo deposit suggests an early mineralisation phase is marked by magnetite, with small amounts of hematite. In parts of the deposit, the conditions were relatively reducing during this phase, as is indicated by the presence of graphite. The sulphide stage is characterised by the formation of tetragonal chalcopyrite, and subsequent formation of bornite and chalcocite. At the end of the sulphide stage, native gold precipitation occurred in spatial association with cobaltite and safflorite. Petrographic evidence, such as magnetite cutting rotated garnet and chalcopyrite interstitial to fayalite grains or filling its fractures, indicates that the mineralisation is post-metamorphism (Réquia and Fontboté, 2000). Most rocks within the deposit area have been altered, with the least affected composed of Ca amphibole ±plagioclase ±quartz ±sericite ±epidote ±chlorite, with or without tourmaline, biotite and K feldspar. These are overprinted by a partially preserved sodic-calcic assemblage that includes the Ca amphibole hastingsite as well as Ca and Na plagioclase. This phase is marked by rocks with high Na2O contents of up to 4.5 wt.%. The dominant alteration associated with mineralisation is potassic, overprinting the Ca-Na phase, characterised by >3.5, up to 4.6 wt.% K2O). It comprises an assemblage that includes K feldspar-quartz ±Ca-amphibole ±cummingtonite ±plagioclase ±sericite ±epidote ±chlorite, with or without biotite, calcite, tourmaline, titanite and kaolinite. It is observed in the central part of the deposit which is also the richest ore zone. Fe-Mg amphibole, represented by cummingtonite, commonly replaces Ca-amphiboles. The local replacement of Mg-hornblende by actinolite is accompanied by epidote, chlorite and quartz formation. Plagioclase crystals, mainly of labradoritic composition, are extensively replaced by K feldspar (orthoclase). Biotite dominates in rocks with only minor or no K feldspar, in association with titanite and quartz (Réquia and Fontboté, 2000). This alteration assemblage developed under intense ductile deformation at temperatures between 650 to 550°C (Lindenmayer, 1990). The ductile shear event persisted from 2851±4 to 2761±3 Ma (U/Pb zircon, Machado et al., 1991). This was followed by sinistral transtensional brittle shearing overprinting the earlier structures with a sub-parallel fabric, dated by Mellito et al. (1998), from magnetite in brecciated iron rocks (2172±230 Ma Pb-Pb) and from chloritised gneisses (2135 21 Ma, Rb-Sr, whole rock). This was accompanied by another hydrothermal event at temperatures of <370°C characterised by the infiltration of Ca-bearing fluids accompanied by intense chloritisation of almandine, biotite and hastingsite within the iron-rich rocks. Mineralisation associated with this phase represents the late Riedel shear controlled veining described above and includes quartz, stilpnomelane, fluorite, allanite, chalcopyrite, molybdenite, cobaltite and gold (Souza and Vieira, 2000) with greenalite, fluorite and uraninite enclosing fayalite and grunerite (Lindenmayer and Teixeira, 1999; Lindenmayer, 2003). The estimated mineral resources prior to 2000 were of the order of 789 Mt with 0.96% Cu and 0.52 g/t Au (Souza and Vieira, 2000). Following the 2004 feasibility study, CVRD quoted reserves of: 986 Mt @ 0.82% Cu, 0.49 g/t Au at a 0.5% Cu cutoff. The Salobo I processing plant commenced production in 2012 with a total capacity of 12 Mtpy of ore processed. The open pit mine and mill reached planned capacities of 12 Mtpy of ore processed and 197 000 tpy of copper in concentrates in quarter 4 of 2016 (Vale Annual Report, 2016). TOTAL Reserves - 1193.4 Mt @ 0.61% Cu, with a recovery range of 80 to 90% of contained Cu. Travelling - Carajas, Brazil to Copiapo, Chile (via Marabá, Brasilia, Sao Paulo and Santiago) ...................... Friday 8 & Saturday 9 June, 2007. Andean Overview Workshop ...................... Saturday 9 June, 2007. An overview workshop was run late on Saturday 9 June, 2007 in Copiapo, Chile at the beginning of the Andean segments of the tour to provide a context to the tectonic, geological and metallogenic setting of the IOCG deposits of the Andes and descriptions of other deposits in the region not on the itinerary. The workshop was led by Dr Carlos Arevalo of the Chilean Servicio Nacional de Geología y Minería (SERNAGEOMIN). Punta de Cobre district - Field Workshop ...................... Sunday 10 June, 2007. A field workshop was run in the Punta de Cobre district. It provided a context setting to the major Candelaria deposit and an impression of the anatomy of an important IOCG district, the geologic, structural and metallogenic setting, the distribution of alteration and different styles of mineralisation. The workshop was led by Dr Carlos Arevalo of the Chilean Servicio Nacional de Geología y Minería (SERNAGEOMIN), an acknowledged expert on the district, its geology and mineralisation. A series of iron oxide Cu-Au(-Zn-Ag) deposits occur within the Punta del Cobre belt which hosts the Punta del Cobre mine, sensu strictu and La Candelaria the largest of these deposits. Other smaller mines that extend over a 25 km north-south interval, centred on La Candelaria and Punta del Cobre include Manuel Antonio Matta, Hernan Videla Lira, Jilguero, Alcaparrosa, Santos, Biocobre and La Plata. La Candelaria is described in detail in a separate record, which also includes a geological map of the Punta del Cobre district. The Punta del Cobre belt lies within an Early Cretaceous continental volcanic arc and marine carbonate back-arc basin terrane whose sequences are intruded by Early Cretaceous granitoid plutons that form part of the Chilean Coastal Batholith. The Punta del Cobre belt deposits are found fringing the eastern margin of the batholith within (eg., La Candelaria) or just outside the contact metamorphic aureole (eg., the Punta del Cobre district). Andesitic volcanic and volcaniclastic host rocks are intensely altered by biotite-quartz-magnetite. This style of alteration extends much further to the east of the intrusive contact than the metamorphic mineral associations in the overlying rocks that are clearly zoned outboard. Local areas of intense calcic amphibole veining that overprints all rock types occur within the contact metamorphic aureole. Chalcopyrite mineralization which crosscuts and thus post-dates all of the major metamorphic and metasomatic assemblages is paragenetically late. Deposits found close to the contact of the batholith and the deeper parts of the sequence in the Punta del Cobre district are characterised by abundant magnetite with associated biotite-quartz alteration, which is overprinted by fracture-controlled calcic amphibole, and chalcopyrite-pyrite mineralization. Potassium feldspar-chlorite and/or biotite ± quartz plus magnetite ± hematite occur in the intermediate parts of the hydrothermal system. Up-section and, in places, laterally, these assemblages grade into pervasive albite-chlorite-calcite-hematite that are spatially associated with Cu-Au mineralization in the more distal portions of the system. Mineralization is controlled by tectonic structures and their intersection with massive volcanic rocks and overlying volcaniclastic rocks. Isotopic ages of alteration minerals associated with the metallic mineralisation indicates that the bulk of the iron oxide mineralization formed between 116 and 114 Ma, and the main copper-gold mineralization between 112 and 110 Ma, and that hydrothermal activity was coeval with both the emplacement of the Copiapó Batholith and regional uplift. They also imply burial during the mineralisation was no greater than 2-3 Km. Deposits other than La Candelaria account for another 120 Mt @ 1.5% Cu, 0.2 to 0.6 g/t Au, 2 to 8 g/t Ag, with the larger deposits producing up to 1.5 Mt of ore per annum. Mantoverde .......... Monday 11 June, 2007. The Mantoverde IOCG deposit cluster is located in the Los Pozos district of the Chilean Coastal Cordillera, some 400 km south of Antofagasta and 100 km north of the town of Copiapo in northern Chile. Individual deposits include Manto Verde, Manto Ruso, Manto Monstruo and Monte Cristo (#Location: 26° 33' 57"S, 70° 18' 45"W). The Los Pozos district falls within a structural segment bound to the east and west by two branches of the north-south trending Atacama Fault Zone (AFZ), an arc-parallel wrench fault system that extends for more than 1000 km along the Chilean coast. The prominent 340 to 345° trending and 40 to 50°E-dipping brittle Manto Verde fault cuts this segment of the AFZ and controls the main Cu-Au ore zone. The district is predominantly composed of Jurassic and/or possibly Early Cretaceous andesitic flows and breccias which are interpreted to correlate with either the Jurassic La Negra Formation or the Early Cretaceous Bandurrias Group. These cataclased andesitic volcanics host rocks are intruded by coeval (?) early Cretaceous granitoids of the Chilean Coastal Batholith. Granodiorites and monzonites of the ~130 Ma Las Tazas Plutonic Complex are found in the western part of the Manto Verde deposit, while diorites, monzodiorites, granodiorites and tonalites of the ~127 Ma Remolino Plutonic Complex lie to the east. For detail of the regional setting of the Chilean Coastal Cordillera in the Central Andes, see the Central Andes and Bolivian Orocline record. The Cu-Au ores of the Los Pozos district are hosted mainly in specularite-dominated tabular breccia bodies (Mantoverde), breccia pipes (Manto Ruso and Manto Monstruo) and stockwork bodies (Monte Cristo). All are associated brittle faults belonging to the AFZ, which were emplaced during an extensional phase of sinistral strike-slip and dip-slip tectonism of that complex Jurassic to early Cretaceous major regional fault system. The Mantoverde deposit consists of three breccia units paralleling the 12 km long Mantoverde Fault for at least 1500 m. The Mantoverde Fault which strikes NNW and dips at 40 to 50° E, connects two major branches of the AFZ. The hangingwall Manto-Atacama breccia is a ±100 m wide, matrix supported, specularite rich, hydrothermal breccia that follows the Mantoverde Fault along strike and down dip although it thins with depth. The degree of brecciation and mineralisation decreases gradually outwards from the fault into the andesite wall rocks. In contrast the footwall Manto Verde Breccia is a ±20 m wide cataclasite with relatively sharp mineralisation boundaries, with sulphides being hosted by andesitic volcanic and deformed volcaniclastic rocks where hypogene grades locally exceed 1% Cu with around 0.25 g/t Au and Elevated REE concentrations. Other Cu-Au deposits also occur on more northwest-trending bends of this fault or the eastern branch of the Atacama fault zone, or at the intersection of the Manto Verde fault and related second order structures. Unlike at Candelaria, early district-wide sodic-calcic alteration is absent in the Los Pozos district (Rieger et al., 2010), although widespread sporadic, weak selective albitisation of plagioclase is taken to represent sub-ocean floor spilitisation (Benevides et al., 2007). Benevides et al. (2007) interprets the following sequence of regional- to district-scale alteration: (1) Early, sporadic, widespread, but poorly exposed potassium-iron metasomatism which converted both granitoid and volcanic rocks to orthoclase (with subordinate biotite), accompanied by the deposition of magnetite (at 130 to 126 Ma; Chen, 2010), with associated fluorapatite, and minor pyrite, but no chalcopyrite. Homogenisation temperatures of 550 to 460°C are estimated for this phase (Benevides et al., 2007). (2) Subsequent regional scapolitisation in the area between the Atacama fault system and the marginal basin, characterised by marialitic scapolite. Later in this second stage, much of the scapolite was replaced by chlorite as part of an episode of chlorite and sericite (hydrolytic) alteration and veining (at 350 to 300°C), with minor development of hematite, pyrite and trace chalcopyrite (Benevides et al., 2007). This style of alteration grades from a slightly chloritised country rock, to chlorite-quartz veinlets, into chlorite-quartz-cemented hydrothermal breccias with mostly silicified, and occasionally K-altered, fragments, the Breccia Verde as detailed below (Rieger et al., 2010). The Mantoverde IOCG sensu stricto deposits, were subsequently emplaced along the main and, more commonly, subsidiary segments of the major Atacama fault system, together with chalcopyrite-bearing, but sub-economic metasomatic magnetite, and copper-barren magnetite-fluorapatite-pyrite bodies. All are hosted by Middle to Upper Jurassic andesites of the La Negra Formation, and by diorite and monzodiorite assigned to the Lower Cretaceous (126 to 120 Ma) Sierra Dieciocho plutonic complex (Benevides et al., 2007). In the immediate Mantoverde district, mineralisation is developed within an intensely fractured structural block, delimited by the subvertical central and eastern branches of the northsouth Atacama fault system, connected obliquely by the northnorthwest trending, brittle, Mantoverde fault (MVF). The MVF is a releasing strike-slip duplex, representing a transfer zone between the central and eastern branches of the Atacama fault system. Most of the Mantoverde deposits are closely associated with a 12 km interval of the MVF and sub-parallel minor faults (Benevides et al., 2007; Rieger et al., 2010; Rieger et al., 2010; Rieger et al., 2009). A loosely constrained Early Cretaceous age of mineralisation is based on K-Ar-dating of two samples of hydrothermal sericite from Mantoverde Norte, with minimum ages of 117±3 Ma from an andesite and 121±3 Ma from a granite dyke (Vila et al., 1996). A two-point Re-Os isochron age derived from magnetite yielded 116 Ma, consistent with the alteration ages (Mathur et al., 2002). 1) Manto Atacama, a specularite-cemented, hydrothermal breccia, averaging 80 m in thickness (locally up to 200 m), in the hanging wall (east) of the 40 to 50° east-dipping MVF. It is composed of sub-angular to sub-rounded clasts, a few centimetres across, of mainly andesitic or granitoid igneous rocks in a mineralised, calcite-bearing, coarse-grained specularite matrix, altered to varying degrees by pervasive K feldspar, with more or less intense chlorite, sericite, silica and/or carbonate. 2) Transition zone, an adjacent specularite stockwork zone, immediately to the east and above the Manto Atacama, containing supergene copper oxide and hypogene sulphides, with essentially the same alteration as the Manto Atacama zone. 3) Mantoverde Breccia, a tectonic breccia in the footwall (west) of the main fault plane of the MVF, commonly 20 to 40 m thick. It comprises a rock flour matrix cataclastite, enclosing angular andesite and/or diorite clasts that are commonly a few millimetres to about 10 cm in diameter, with silica, chlorite and minor to moderate K feldspar alteration. 4) Breccia Verde, which is developed on both sides of the MVF, and has a gradational boundary with both the Transition zone and Mantoverde breccia. It is largely barren, and is composed of silicified and pervasively K feldspar altered volcanic and dioritic clasts within a matrix of chlorite-quartz, containing calcite and subordinate sericite, grading outwards into a chlorite-quartz stockwork. It is cut by sparse to moderately frequent sets of K feldspar±quartz, calcite±siderite, specularite,±quartz and sericite veinlets. 5) Magnetite Zone, developed between the Breccia Verde, an intrusion of the 120 to 127 Ma Sierra Dieciocho pluton to the west, and the Mantoverde Breccia to the east, and mainly at depth. It comprises magnetitechlorite-sericite-K feldspar-cemented breccias, with clasts of igneous rock that are predominantly altered to magnetite (including mushketovite), K feldspar and quartz, cut by veinlets of K feldspar±quartz, calcite, sericite and late specularite-calcite. Pyrite and chalcopyrite occur as small patches, disseminations, or in discontinuous veinlets. This zone is representative of the other magnetite-sulphide bodies in the south of the district (Rieger et al., 2010). The bulk of the mining to 2010 exploited supergene mineralisation which occurs within the zone of oxidation that consistently persists to a depth of 150 to 250 m below the surface. Mineralisation comprises chrysocolla, brochantite, atacamite, almagre, malachite and copper-bearing hematite, jarosite, and goethite, disseminated in the breccia matrix, as filling of veinlets, and as a patina on, or patches within rock fragments (Rieger et al., 2010; Benevides et al., 2007). Below the base of supergene oxidation, in the Manto Atacama breccia, the specularite-rich matrix contains pyritechalcopyrite, with the chalcopyrite being locally replaced by digenite and bornite. The breccia is cut by veinlets of K feldspar±quartz, tourmaline, or sericite, with late stage calcite and specularite veinlets (Rieger et al., 2010). Neither native gold, nor electrum have been reported from the Mantoverde district, although there is a close correlation between gold and copper grades, and gold has been detected in both, chalcopyrite and pyrite (Rieger et al., 2010). In the northern half of the district, the mineralised tectonic breccias (e.g., Mantoverde Breccia), specularitecemented, hydrothermal breccias (e.g., Manto Atacama), and outer halo of mineralogically identical veins (Transition zone) are characterised by primary specularite and largely developed in the hanging wall of the MVF. In contrast, in the southern half of the district, there are hypogene, crudely tabular, massive bodies of magnetite-pyrite and magnetitechalcopyrite (e.g., the Magnetite zone), predominantly in the footwall of the Mantoverde fault, while massive and irregular bodies of magnetite-apatite±pyrite are developed along the eastern branch of the Atacama fault system (Benevides et al., 2007). The hypogene minerals of the Magnetite zone and the magnetite rich bodies in the south of the district comprise (1) magnetite stockworks and disseminations; (2) elongate magnetite-chlorite-sericite-K feldspar-cemented breccias, with igneous rock fragments that are mainly altered to an assemblage of magnetite, K feldspar and quartz; and (3) massive magnetite bodies. Both primary magnetite and mushketovite are present. These magnetite-rich rocks may be either barren, or contain chalcopyrite (and/ or pyrite), mainly as small patches, disseminations and/or discontinuous veinlets (Rieger et al., 2010). Rieger et al. (2010), notes a vertical zonation of mineralisation-associated iron oxides, with a downward transition from upper hematite to magnetite at depth. Tilting and differential rotation across the MVF has resulted in the magnetite mineralisation being exposed to the south, while drilling confirms the continuity of similar magnetite dominant mineralisation at depth immediately below the Mantoverde Breccia ores in the footwall of the MVF in the north. A lateral transition between specularite breccias and magnetite is not evident to the north, although the two are juxtaposed across the MVF, again due to the differential rotation accommodated by that structure. However, in the south, the Manto Atacama is only poorly developed and gives way to magnetite-rich rocks in the hanging wall, footwall and at depth. Benevides et al. (2007) conclude that on the basis of textural relationships in both breccias and veins, the crystallisation of specularite and chalcopyrite was coincident. However, Rieger et al. (2010) interpret them to have been emplaced at different times, with the main mineralising events being (1) an early high-temperature iron oxide stage, comprising the bulk of the specularite and magnetite in the district; (2) a sulphide stage responsible for the main copper-gold mineralisation; and (3) a late stage, represented mainly by calcite±specularite and specularite veining, and pervasive carbonatisation. They suggest the iron oxide stage comprises early hematite (hm-I), followed by early magnetite (mt-I) which wholly or partially replaced hm-I (to form mushketovite), accompanied by pervasive K feldspar alteration, minor tourmaline and weak scapolite. Subsequent, variably intense silicification, pervasive sericitisation and minor pyrite (py-I) was followed by a second phase of magnetite (mt-II) and chloritisation, with specularite locally developing rather than mt-II. Rieger et al. (2010) see the sulphide phase as occurring in isolation, after the development of iron oxides (including the specularite breccia matrix), K feldspar, sericite, silica and chlorite. The iron oxide stage of Rieger et al. (2010) corresponds to both the potassium-iron metasomatism, scapolitisation and sericite-chlorite phases of Benevides et al. (2007), described above. Both agree on a terminal phase of alteration, which comprises largely barren calcite veining, variably accompanied by quartz. Rieger et al. (2010) suggest the specularite associated with ore in the north of the district is their hm-I, on the periphery of the mineralised system, while the magnetite in the mineralisation at depth and to the south is both mt-I mushketovite after hm-I, and mt-II, which is deeper and hotter, proximal to the centre of mineralisation. Rieger et al. (2010), noted a similar zonation in sulphur isotope signatures. Chalcopyrite in the Mantoverde district shows a wide range in sulphur isotope composition, with δ34SVCDT of between -6.6 and +10.0‰ (Rieger et al., 2010; Benavides et al., 2007). Systematic variation of these data reflect the spatial distribution of the sulphides in the orebodies and their position relative to the MVF. Sulphur isotopic compositions around 0‰ δ34SVCDT, which are compatible with a magmatic-derived sulphur component, are characteristic of chalcopyrite in orebodies with a close spatial relationship with the MVF in the southern and deeper, or proximal part of the Mantoverde district, representing the more internal parts of the hydrothermal system, while higher δ34SVCDT values of around +6‰, are typical of the northern part of the district, or the shallower, levels, suggesting sulphur contribution from non-magmatic sources in the peripheral portions of the hydrothermal system (Rieger et al. (2010) report the δ34S values for pyrite (0.2 to 9.4‰) to similarly indicate a dominantly magmatic source, although also showing systematic variations across the district, interpreted to reflect both the relative distance from inferred fluid conduits and the level of deposition within the hydrothermal system, and possible non-magmatic components on the peripheries of the system. Homogenisation temperatures of between 550 and 460°C have been reported from hypersaline fluid inclusions (32 to 56 wt.% NaCl equiv.) in quartz coexisting with magnetite (Vila et al.,1996; Benavides et al., 2007 and unpublished sources quoted therein), while the main hypogene specularite breccia sulphide mineralisation is calculated to have formed at between 250 and 180°C (Benevides et al., 2007). Homogenisation temperatures of a number of determinations for late calcite-chalcopyrite and calcite veins from two and three phase fluid inclusions with salinities of from 32 to 40 wt.% NaCl equiv. and 1 to 10 wt.% NaCl equiv. returned values of 360 to 160°C and 260 and 112°C respectively (Vila et al., 1996 and unpublished sources quoted therein). The majority of initial 87Sr/86Sr values of altered volcanic rocks and hydrothermal calcite from the district (0.7031 and 0.7060) are similar to those of the igneous rocks of the region. Lead isotope ratios of chalcopyrite are consistent with lead (and by inference copper) derived from Early Cretaceous magmatism. The sulphur, strontium and lead isotope data of chalcopyrite, calcite gangue and altered host rocks respectively, are compatible with the cooling of metal and sulphur-bearing magmatic hydrothermal fluids (with deposition at <350°C) that mix with meteoric waters or seawater at relatively shallow crustal levels. They suggest, input of additional exotic sulphur is likely, though not essential, for the deposition of copper mineralisation, occurring mainly in the shallow, and distal parts of the ore system. Magnetites from the Mantoverde deposit have Os and Re concentrations of 11 to 17 ppt and 4 to 6 ppb, respectively. An initial 187Os/188Os ratio calculated from these is ~0.20, compared to ~0.36 to 0.33 at Candelaria, and from 0.20 to 0.41 for magmatic magnetite from Early Cretaceous batholithic intrusions in the district. These relatively radiogenic ratios are taken to represent a mixture of mantle and crustal components in the ores and batholitic rocks (Mathur et al., 2002). Benevides et al. (2007) interpret isotopic and temperature data they quote from regional and shallow hematitic mineralisation to indicate their potassium-iron metasomatism stage was caused by magmatic fluids, possibly products of the second boiling of granitoid magmas, such as the nearby 126 to 120 Ma Sierra Dieciocho complex. However, they suggest the data indicates a change, probably during the scapolitisation and sericitechlorite phases, possibly due to evaporite derived brines mobilised by marginal basin inversion reflected in the regional sodic alteration event, but even more likely during the deposition of chalcopyrite ore. The copper resource at Mantoverde to the 800 m level was estimated prior to mining at 120 Mt @ 0.72% Cu (0.2% Cu cutoff) including a mineable reserve of 85 Mt @ 0.82% Cu. 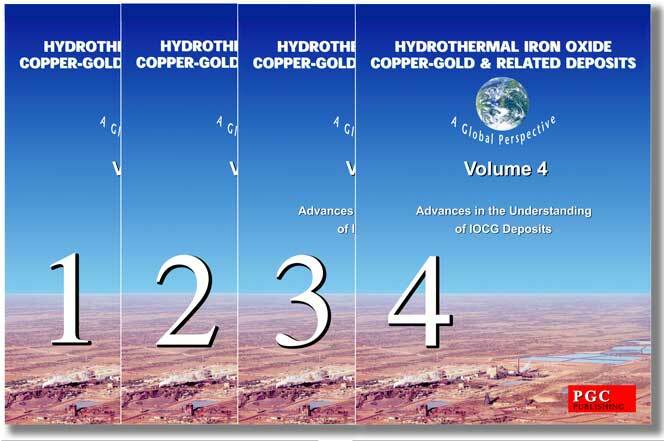 - a hypogene sulphide resource of 440 Mt @ 0.56 % Cu, 0.12 g/t Au at a 0.20 % Cu cut-off. Inferred resource - 2.3 Mt @ 0.16% Cu Acid Sol.. The mine is operated and controlled by Minera Mantos Blancos S.A., which was initially an Anglo American Group company, but was sold to be part of Mantos Copper S.A. in 2015. Candelaria .......... Tuesday 12 June, 2007. The La Candelaria deposit is located some 20 km south of Copiapo. Like Mantoverde and Mantos Blancos it is localised near the Atacama Fault Zone within the Central Andean Coastal Cordillera (or Central Andean Coastal Belt) of northern Chile, and the Chilean Iron Belt (#Location: 27° 30' 55"S, 70° 17' 19"W). The Central Andean Coastal Belt comprises a Late Jurassic to Early Cretaceous volcano-plutonic belt (Sillitoe, 2003) that is is characterised by voluminous tholeiitic to calc-alkaline volcanic piles and plutonic complexes of primitive mantle origin gabbro to granodiorite. It is associated with an extensional to transtensional event when the underlying crust was attenuated and subjected to high heat flow. All of the intrusive rocks are oxidised and belong to the magnetite series (Charrier et al., 2007; Sillitoe, 2003 and sources cited therin). This belt contains a series of IOCG sensu stricto Cu-Au and other iron oxide-alkali altered mineralisation, such as magnetite-apatite deposits, distributed over a north-south interval of >500 km, with related manto deposits further to the north and south. The Candelaria deposit lies within the almost continuously altered, but discontinuously mineralised, Punta del Cobre district, which occupies an area of ~20 × 5 km along the eastern margin of the 120 to 97 Ma Copiapó batholith (Williams et al., 2005; Arévalo, 2006). This batholith, which lies immediately to the east of older Jurassic to Early Cretaceous (>125 Ma) granitoids, comprises the larger ~119 Ma La Brea pluton and ~110 Ma San Gregorio plutonic complex close to Candelaria, one of a group of smaller, similarly aged (111 to 106 Ma) intrusions on the eastern margin of the Copiapó batholith (Arévalo et al., 2006). The district is characterised by a ~12 × 5 km envelope of sodic±calcic alteration, superimposed upon volcanic, sedimentary and intrusive rocks. This alteration is manifested as either (1) albite or sodic-plagioclase, and/ or (2) scapolite, with or without calcic amphibole (mainly actinolite, ferro-actinolite, or actinolitic hornblende), pyroxene and/or epidote. Voluminous sodic scapolite-rich assemblages, commonly (but not always) associated with calcic-amphibole and/or pyroxene±epidote±andradite, are usually stratabound, and within the Abundancia and upper Punta del Cobre formations, largely above the ore zone, possibly representing metamorphosed evaporitic beds in these Early Cretaceous units. These rocks also host small magnetite±chalcopyrite-pyrite mantos. In contrast, where sodic alteration is predominantly albitisation, it is more commonly discordant and pervasive, occurring in igneous rocks, locally with associated minor pyrite±trace chalcopyrite and/or veinlets and disseminations of hematite (Marschik and Fontboté, 2001). Some of the early albite may be due to spilitisation of volcanics, rather than alteration (Ullrich and Clark, 1999). The overall sodic-calcic zone is enveloped by rocks that were affected by propylitisation, and/or contact thermal metamorphic skarn/hornfels alteration related to the Copiapó batholith (Marschik et al., 2003). The contact between the sodic and thermal metamorphism is gradational (Marschik and Fontboté, 2001). The more extensive thermal metamorphic aureole of the batholith, extends over a length of >20 km and width of 2 to 5 km from the contact, producing hornfels and skarns with mineralogies that are dependent upon the host rock, and distance from the contact. Skarn minerals in the thermal aureole include proximal diopsidic-hedenbergite, pyroxenescapolite±andraditic garnet, to distal biotite/quartz/pyroxene±epidote±K feldspar hornfels (Marschik et al., 2000). Early pervasive albitisation accompanied the introduction of widespread specularite, occurring in dilational fractures and open spaces. 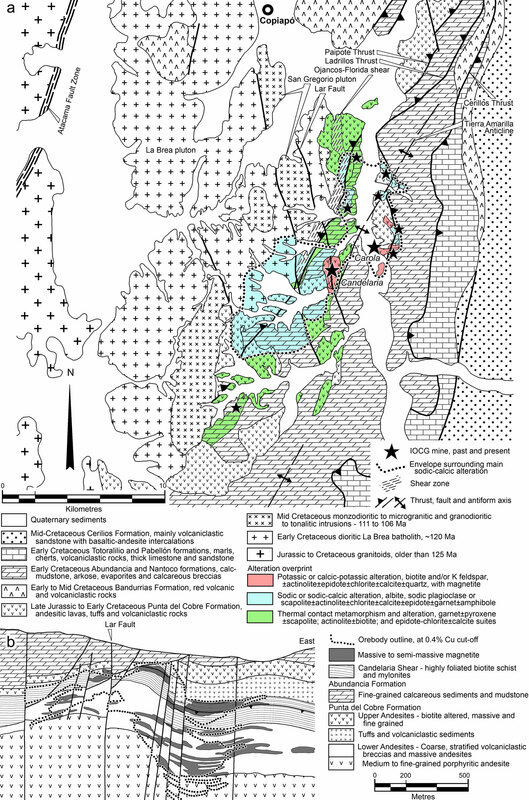 It preceded, and encloses cores of potassic alteration in the district, and occurs below and peripheral to the 116 to 114 Ma pervasive, brown biotite-quartzmagnetite stage (Mathur et al., 2002), and associated almandine±cordierite alteration that accompanied early barren, more intense magnetite mineralisation. This early magnetite was mainly composed of mushketovite after hematite, indicating a shift to more reducing conditions and/or higher temperatures (Marschik and Fontboté, 2001), and more than one pulse and source of iron oxide alteration (Mathur et al., 2002). The deposit lies near the core of the district wide Tierra Amarilla antiform, part of the Paipote fold and thrust system, 20 km to the east of the main Atacama Fault Zone (AFZ). The ore zone is relatively flat lying, broadly concordant with the host sequence of coarse-grained volcaniclastics and massive volcanic flows, breccias and tuffaceous rocks, and a broad, similarly flat-dipping shear zone, with hanging wall evaporite-bearing -limestone, shale and epiclastic rocks. The deposit is capped by the base of the 2 km thick Chañarcillo Group (comprising the Abundancia, Nantoco, Totoralilio and Pabellón formations) that was laid down immediately prior to the mineralisation, and hence the depth of formation is assumed to correspond to the thickness of that unit. The early pre-ore alteration described thus far, is overprinted by a younger (112 to 110 Ma; Mathur et al., 2002), more areally restricted, ore-related intense potassic±calcic alteration (K feldspar-biotite-amphibole) phase, although Re-Os ages of 115 to 114 Ma for molybdenite (Mathur et al., 2002) and two ~111 Ma dates for amphibole and biotite associated with chalcopyrite (Ullrich and Clark, 1999; Arévalo 1999), could represent the main sulphide phase. Fluids associated with the main stage sulphide mineralisation are hypersaline and CO2-bearing (Marschik and Fontboté, 2001). The ore at Candelaria is associated with a complex, multistage event, and occurs: (1) as bodies that are roughly concordant with stratification and comprise replacements and pore filling (mantos); (2) in the matrix to hydrothermal breccias and pseudobreccias; (3) superimposed on massive magnetite replacement bodies; (4) as discontinuous veinlets and stringers in altered host rock; and (5) as massive veins (Marschik et al., 2000; Marschik and Fontboté 2001). The breccia ores represent intervals of high copper grade. They generally occur as irregular zones, and sometimes lens-shaped bodies, 1 to 3 m thick, which are concordant with stratification. They comprise a chalcopyrite-pyrite-magnetite matrix between brecciated, biotite altered, metavolcanic rock clasts. Clasts are very angular to locally rounded, from a few to tens of cm across. The margins of breccia bodies are diffuse and defined by a decrease in the amount of sulphide matrix. Individual clast borders are sharp and form jigsaw patterns, indicating limited transport and rotation after fragmentation, although some may represent replacive pseudo-breccia. The concordant lens-like replacement and pore-infill manto bodies resemble breccias where sulphides fill pore spaces between angular to rounded volcanic and sedimentary breccia clasts. Networks of veins as they are enlarged also form a pseudo-breccia texture (Arévalo et al., 2006). The geology and superimposed alteration of the Candelaria-Punta del Cobre district of northern Chile (a). All of the known deposits lie within the Paipote fold and thrust system (which includes the steeply dipping Ojancos-Florida Shear Zone separating the Copiapó Batholith from the host Punta del Cobre Formation west of the Candelaria mine; as well as the Paipote, Ladrillos and Cerrillos thrusts and Tierra Amarilla anticline). This structural corridor is part of the regional Chivato fault system, which is ~20 km east of the main Atacama Fault Zone (top-left). The largest deposits, Candelaria and Carola are associated with potassic alteration within the broader sodic-calcic zone. Note the potassic core surrounding the Candelaria deposit is the exposure within the open pit mine, not an original pre-mine outcrop. The sodic-calcic alteration includes both stratabound alteration within the overlying Abundancia and Nantoco formations (possibly related to hydrothermal modification of evaporite-bearing beds within those units), and pervasive, discordant alteration within the volcanic and volcaniclastic rocks of the Punta del Cobre Formation (after Marschik et al., 2000; Marschik and Fontboté, 2001; Arévalo et al., 2006). East-west cross section through the Candelaria mine (b). The diagram illustrates the distribution of the manto-like early magnetite and the outline of the overprinting +0.4% Cu orebody, both of which are largely confined to the coarse stratified volcaniclastic breccias and interlayered massive andesites of the Lower Andesites, and the flat-lying Candelaria Shear that caps this unit and the ore deposit. Note the concentration of steep faults near the core of the deposit. Distribution of alteration within the section comprises albite/sodic plagioclase-quartz-biotite-magnetite±K feldspar minor Ca amphibole below the orebody; biotite-quartz-magnetite±K feldspar and abundant Ca amphibole (largely actinolite) within the ore zone; biotite-quartz- almandine±cordierite and common Ca amphibole within the upper Candelaria Shear; biotite-amphibole with K or Na feldspar in the tuffs and volcaniclastic sediments and Upper Andesites above the shear; and scapolite±quartz±pyroxene±Ca amphibole within the overlying Abundancia Formation (after Marschik et al., 2000; Marschik and Fontboté, 2001; Arévalo et al., 2006). Copper ore is associated with magnetite and/or hematite and is dominantly composed of chalcopyrite and pyrite, with gold occurring as small inclusions in the chalcopyrite, within micro-fractures in pyrite and as a mercury-goldsilver alloy (Williams et al., 2005). At the deeper levels in the mineralised system, chalcopyrite has a close spatial association with calcic amphibole (mainly actinolite) in an assemblage that also includes biotite, K feldspar±epidote±sodic plagioclase. Magnetite is ubiquitous, occurring as massive bodies, with or without superimposed sulphide mineralisation, although hematite is rare. Intermediate levels, are characterised by potassic alteration (biotite and/or K feldspar), with or without local developments of calcic amphibole±epidote, sodic plagioclase, and/or local anhydrite. In shallower and distal parts of the system, chlorite is developed at the expense of biotite and amphibole, and albite, chlorite and carbonate alteration increases in intensity. Peripheral to the mineralisation, hematite becomes the dominant iron oxide (Williams et al., 2005). This alteration pattern is complicated by the influence of contact metamorphism related to components of the 120 to 97 Ma Copiapó batholith, as described above. The increasing sodiccalcic alteration in the upper levels of the Candelaria pit area, above the potassic and chloritic zones, may reflect the overlying evaporite-bearing Abundancia Formation (Marschik and Fontboté, 2001). 3) the late stage at <250°C, with hematite-calcite and locally minor sulphides. Sulphides from Candelaria and some other occurrences in the Punta del Cobre district yielded δ34SCDT values largely between -3.2 and +3.1‰, with some as high as 7.2‰ for late stage mineralisation, or up to 6.8‰ in the marginal parts of the system (Rabbia et al., 1996; Ullrich and Clark, 1999; Marschik and Fontboté 2001). Marschik and Fontboté (2001) interpret these isotopic data to be consistent with a dominantly magmatic source for sulphur, with a minor contribution during their stage 2, but definite influence in stage 3, from a peripheral evaporite-bearing sedimentary host sequence (e.g., Mathur et al., 2002; Marschik and Fontboté 2001; Ullrich and Clark, 1999). Barton et al. (2005) reported that unpublished Sr isotope data for altered and host rocks in Candelaria-Punta del Cobre district, during both early sodic-calcic and late potassic stages of hydrothermal activity imply there are large contributions of non-igneous Sr, implying the ore systems involved influx of fluids from outside the local batholithic granitoids. Arévalo et al. (2006) note that the sulphide ages quoted above, corresponds closely to that of the San Gregorio plutonic complex of the Copiapó batholith, supporting a magmatic origin for the main sulphide mineralisation. They interpret the sulphide mineralisation to have been the product of magmatic fluids of a cooling hydrothermal system, emplaced during synplutonic deformation and dilation at the ductile-brittle transition, in the thermal aureole of the San Gregorio plutonic complex. An isochron calculated by Re/Os ratios from hydrothermal magnetite and sulphides at Candelaria and the small satellite deposit Bronce, constrains initial 187Os/188Os ratios of 0.36±0.10 and 0.33±0.01 respectively. These values are broadly similar to the calculated initial 187Os/188Os ratio for magmatic magnetite in nearby batholithic rocks that range from 0.20 to 0.41. These relatively radiogenic ratios also represent a mixture of mantle and crustal components in both the ores and batholitic rocks (Mathur et al., 2002). The pre-mining mineable reserve comprised 470 Mt @ 0.95% Cu, 0.22 g/t Au, 3.1 g/t Ag within a geological resource of 600 Mt at a similar grade. The mine is operated by the Freeport subsidiary Compania Contractual Minera Candelaria. Mantos Blancos .......... Wednesday 13 June, 2007. The Mantos Blancos copper-silver deposit is located in the Coastal Range of northern Chile, some 45 km NE of the Pacific coastal city of Antofagasta in northern Chile (#Location: 23° 25' 52"S, 70° 3' 22"W). It lies within the Atacama Fault Zone and is hosted by a Triassic sequence of acid volcanics, mainly rhyolites and dacite which dip at 10 to 45° SE and, cut upper Palaeozoic sediments and metasediments. These are in turn overlain by Jurassic clastics and limestones, Jurassic andesites and Cretaceous andesites and dacites. In the mine area the host volcanics are intruded by a sill like sub-volcanic andesite body, by sheets of dacite and abundant andesite dykes. ii). a younger (141-142 Ma) potassic, propylitic and sodic alteration phase, coeval with dioritic and granodioritic stocks and sills, and dioritic dykes. The principal ore formation is genetically related to the second hydrothermal event, and comprises hydrothermal breccias, disseminations and stockwork-style mineralisation, associated with sodic alteration. iv). silicification, represented by quartz phenocrysts, microcrystalline aggregates in the groundmass and as occasional veinlets and amygdule fillings. The mineralisation occurs as irregular bodies of oxide and sulphide copper with economically significant associated silver. The oxide minerals atacamite and chrysocolla are common in the upper levels of the sulphide body associated with faulting and intense brecciation. The hypogene sulphide assemblages have distinctive vertical and lateral zoning, centred on magmatic and hydrothermal breccia bodies, which are interpreted to constitute feeders to the main mineralisation which is largely distributed in irregular, lenticular bodies roughly parallel to stratification. A barren pyrite root zone is overlain by pyrite-chalcopyrite, and followed upwards and laterally by chalcopyrite-digenite or chalcopyrite-bornite. A digenite-supergene chalcocite assemblage characterises the central portions of high-grade mineralisation in the breccia bodies. Silver is found in the lattices of both the oxide and sulphide minerals and correlated with the Cu grade. Economic grade ore is found over an interval of 3 x 1.5 km and to a depth of 450 m. In 1995 the pre-mining resource was calculated at 170 Mt, of which 91 Mt were oxide ore @ 1.4% Cu and 89 Mt of sulphide ore @ 1.6% Cu and 17 g/t Ag. Inferred resource - 70.7 Mt @ 0.18% Cu Acid Sol.. The mine is operated by Minera Mantos Blancos S.A., which was initially an Anglo American Group company, but was sold to be part of Mantos Copper S.A. in 2015. 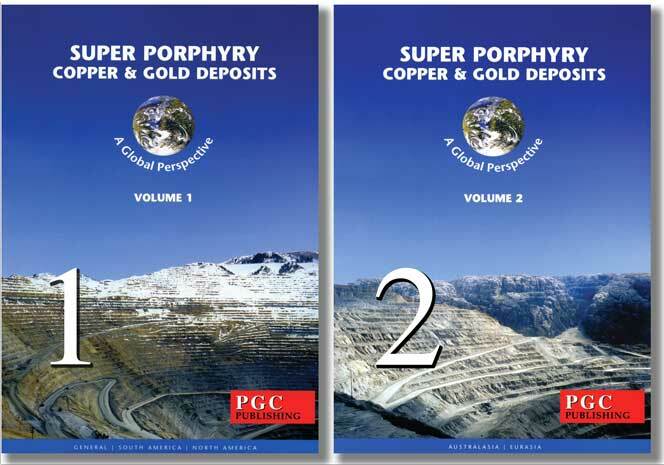 The summaries above were prepared by T M (Mike) Porter from a wide range of sources, both published and un-published. Most of these sources are listed on the "Tour Literature Collection" available from the IOCG 07 Tour options page. T M (Mike) Porter of Porter GeoConsultancy Pty Ltd.